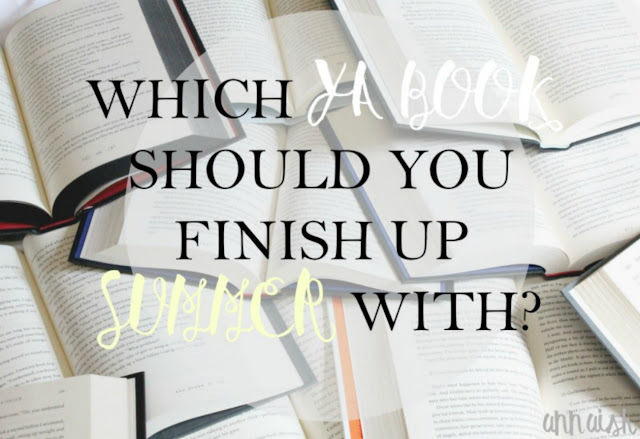 annaish: Quiz: WHICH YA BOOK SHOULD YOU FINISH UP SUMMER WITH? Summer is coming to an end and I'm trying to read a few more summer contemporaries. How about you? If you are, then, here I am, making your life a little easier. ;) I made this fun quiz for you to find that perfect book to wrap up summer. There are four answers. The books (the answers) I picked out are fairly new YA releases. Have fun! Did you enjoy this quiz? Do you want to see more quizzes on Annaish? Let me know! I got Summer Days and Summer Nights which is great because I've been wanting to read that book for a while now! That's great! Hope you enjoy it! I got Summer Days and Summer Nights, too! But I'm completely in denial that summer is ending. I got First & Then! Funny - I actually considered reading it for a while, but I heard it was 80% descriptions of football games and I decided not to. What are your thoughts on it? Yes, I'd love to see more quizzes! I got Wink poppy midnight! These quizzes are so fun! Congrats! Thank you, I'm glad you enjoy the quiz. Anna! I feel like you haven't posted in forever! I loved this quiz, though. Quizzes are super fun and I always find myself lost in a loop of the buzzfeed ones... I got Wink Poppy Midnight, which I have definitely been wanting to read. I would love to see more quizzes soon! I got First & Then, which I actually read in May, but I think I may end up reading Summer Days and Summer Nights because it seems like a fun way to finish the summer (still in denial summer is ending; my volunteer work ended last week and now I feel like I have no life). Thank you! Haha, I guess so! I hope you enjoy it, Amy. I got "Summer Days and Summer Nights." Will try and read it before Summer is up. Such a great idea, loved this post! This is too cute. <3 I got Summer Days and Summer Nights - which I've been dying to read. Ah thank you! You must, it's such a cute read.